Piccolo FUSS 102-20 from HANG® is the new, even better version of model 101F. 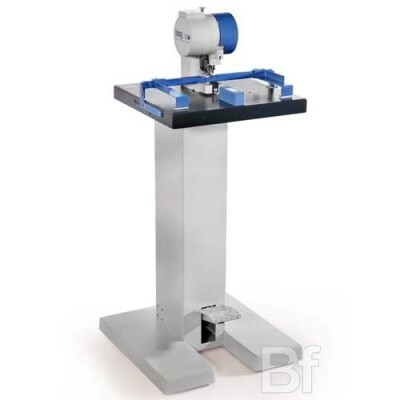 This sturdy eyeletting machine stands on a solid foot with a comforable size working table and has a smooth treadle operation. It has an automatic eyelet infeed via an easy to refill eyelet container, so both hands are free for setting eyelets in advertising products, official documents, labels, calenders, catalogs, albums etc. Eyelet No. 24 iron-nickel plated. Suitable for both manual devices (Piccolo, PiccoStar) and automati..
Eyelet No. 24 iron-brass plated. Suitable for both manual devices (Piccolo, PiccoStar) and automatic..
Eyelet No. 25 iron-nickel plated. Suitable for both manual devices (Piccolo, PiccoStar) and automati..
Eyelet No. 25 iron-brass plated. Suitable for both manual devices (Piccolo, PiccoStar) and automatic..